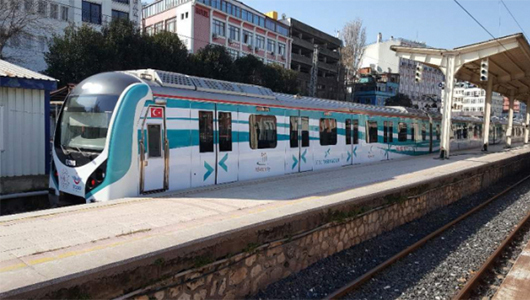 Electric trains made by Korea’s Hyundai Rotem Co. commenced operation on the Marmaray suburban rail corridor that runs below the Bosphorus Strait to connect the Asian and European sides of Istanbul. Hyundai Rotem, locomotive and rolling stock unit of Hyundai Motor Group, said Wednesday it celebrated the official opening of the Marmaray where its electric multiple units (EMUs) will service the 77-kilometer long suburban rail corridor in Istanbul, Turkey on Tuesday (local time). The ceremony was joined by Turkish President Recep Tayyip Erdoğan who rode an inaugural train. Marmaray is a commuter rail line in Istanbul that includes rail tunnel under the Bosphorus Strait, which divides Europe and Asia. Erdoğan at the ceremony said the suburban train services were expected to carry up to 75,000 passengers per hour or 1.7 million passengers a day. Hyundai Rotem in 2008 won a 670 billion won ($591 million) order to supply 440 Marmaray EMUs. It has supplied 335 EMUs so far and the rest will be shipped by the end of this year, according to the company. The company obtained its first train order in Turkey in 1996 and continued to win new orders including electric locomotive for Turkish railroad authority and trams in Izmir. Its total train orders in Turkey reach 1,900 units so far. Last week, Hyundai Rotem’s unmanned metro trains started commercial operation in Ahmedabad, northwestern city of India. Indian Prime Minister Narendra Modi joined a test ride after the opening ceremony.